고려 수월관음도의 도설내용은 『大方廣佛華嚴經』「入法戒品」에 근거하며, 「입법계품」은 선재동자가 깨달음을 얻기 위해 53명의 선지식을 찾아 가는 남방순례 중 28번째 관음보살을 방문하여 보살도는 묻는 장면이다. 이 그림은 이러한 경전의 내용을 드라마틱하게 표현한 것인데, 그림은 관음보살과 선재동자라는 이야기의 두 주인공이 주된 내용을 이루고 있다. 화면의 중심에는 보타락가산 금강암좌에 반가좌 앉은 관음보살을 압도적인 크기로 배치하였고, 우측 하단에는 무릎을 살짝 구부리고 합장하며 공손히 보살도를 묻는 선재동자를 조그맣게 배치하여 두 주인공 사이의 심오한 공간감을 나타내었다. 이외 이 작품의 중요한 모티프를 이루는 청죽·바위·정병 등 경물의 표현과 배치 등은 고려 후기 수월관음도상의 전형을 보여주며, 존상의 형태와 구도 등에서도 고려 불화답게 빈틈없는 짜임새와 균형감을 보여준다. 선묘 역시 굵고 가는 다양한 선을 자유자재로 구사하여 물 흐르듯 유려한 선묘를 보여주고, 화려하고 복잡한 문양을 전신에 걸쳐 시문하였음에도 고귀한 품격을 놓치지 않았으며, 붉은색과 백색, 금색 등 고급스러운 색들이 상호 조화를 이루며 요란하지 않은 세련된 아름다움을 표출하였다. 이 작품은 비록 박락되고 손상된 부위가 후대에 수리되었지만, 고려 후기 수준 높은 불교회화의 세계를 이해할 수 있는 중요한 작품으로 판단된다. 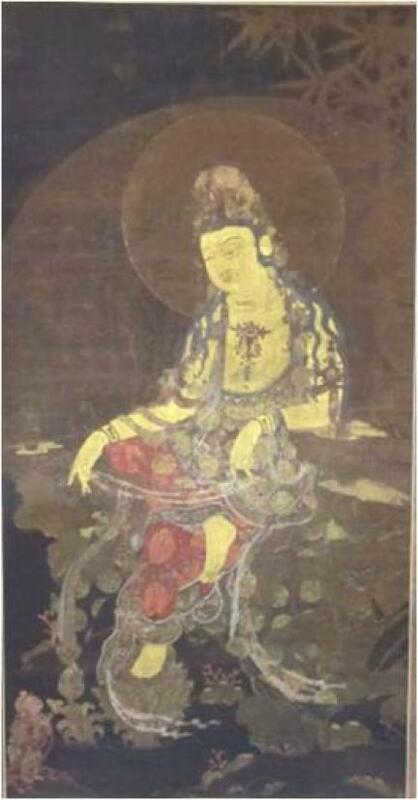 This portrait of the Avalokitesvara Bodhisattva painted by a Goryeo artist was inspired by an episode in the chapter of the Avatamsaka Sutra titled Entering the Dharma Realm, in which a young pilgrim named Sudhana meets Avalokitesvara Bodhisattva during his travels around the South to meet fifty-three spiritual advisors. Various symbolic objects, including the blue bamboo, rock and ritual ewer depicted with the bodhisattva, are characteristic elements of the Avalokitesvara Bodhisattva portraits painted by late Goryeo artists. While the painting is damaged and shows traces of repair work, its outstanding harmony and composition make it a valuable source of knowledge on the Buddhist paintings of late Goryeo (918-1392).